304 total rooms, 755 total beds, 4 corner rooms, 3 disabled rooms, 221 standard rooms, 9 corner suites, 67 family rooms. Sea, land views are available. 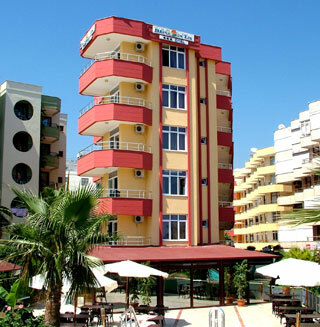 Direct dial telephone, music on TV, balcony or terrace, minibar, safe box, satellite tv, air condition, shower, wc, hair dryer, make up mirror, telephone in bathroom. Internet cafe, hairdresser, drugstore, market, boutique, leather shop, jewellery store, cinema, 24 hrs room service, doctor, rent a car. 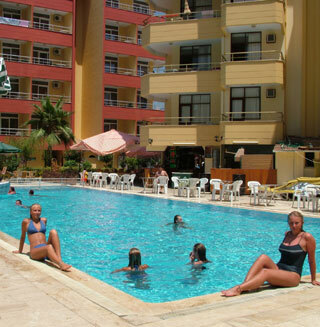 Sports & Recreation: Outdoor swimming pool (with children section), heated (indoor) swimming pool with children section, aquapark, Turkish bath, sauna, massage, jacuzzi, SPA, fitness center, table tennis, billiards, disco, animation programs, tennis court, tennis course, beach volley, basketball, children's playground, parasailing, water ski, jet ski, canoe, wind surf, mini club, bowling, pedalos, catamaran, some of them due to fee. Lobby bar, snack bar, pool bar, piano bar, vitamin bar, live music, children buffet, A la carte and open buffet service. 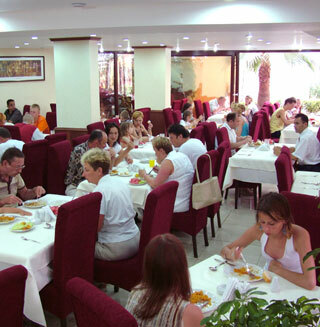 1 Mediterranean restaurant (48 pax), 1 main restaurant (384 pax), 1 fish restaurant (40 pax), 1 Turkish restaurant (48 pax). International Cuisine, Turkish Cuisine, Mediterranean Cuisine. 3 meeting rooms (25 min. 510 max. capacity). Kemer downtown 1 km, City center 40 km. Antalya Airport 50 km.